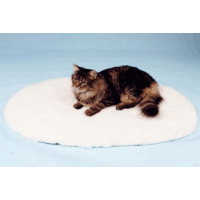 Pet Life VetBed® Oval White Bed is designed to fit in baskets or plastic beds. It is a hard wearing, everyday bed that has unique properties suitable for animals at all life stages. Younger Animals: Keeping them safe and warm, the special drainage properties ensure that they stay dry and warm, even in the event of an accident. Birth Stage: Keeps the mother and baby warm and dry whilst retaining body heat and reducing the risk of hypothermia. The texture gives comfort and security and encourages mobility in the younger by aiding grip. This hygienic, non irritant and non allergic cosy bed is also machine washable and can be cut to fit.